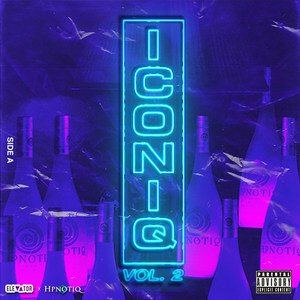 Iconic liqueur brand Hpnotiq launches the second year of its anticipated ICONIQ mixtape in partnership with premier digital publication ELEVATOR. This year's partnership will feature a double-disc mixtape. The first release of the ICONIQ Vol. 2 mixtape (Side A) will feature a ten-track tape, with an exclusive single from legendary New York-based trio, The LOX (Jadakiss, Styles P and Sheek Louch). This Winter, the brand will release its Side B tape featuring nine original tracks from the next-generation of hip-hop. "This year's ICONIQ mixtape continues the brands storied relationship with hip-hop, bringing together signature sounds, cultural influence, legends and the leading voices of the underground hip-hop scene," said MaryCrae Guild, Brand Manager, Hpnotiq Liqueur. "We're thrilled to continue our partnership with ELEVATOR, discovering the hottest SoundCloud artists and are excited to announce our exclusive track by hip-hop's very own The LOX." ICONIQ Vol. 2 will feature the legendary Yonkers rap group The LOX, who have delivered an authentic brand of street inspired hip-hop for nearly 20 years. In anticipation for their Living off Xperience album release in Fall 2018, Jadakiss, Styles P and Sheek Louch join Hpnotiq for track and music video "I Don't Care." Staying true to their sound, "I Don't Care" bridges classic hip-hop and the underline issues relevant to society. "We're excited to join Hpnotiq, an iconic brand that shares a commitment to hip-hop," said Jadakiss. "The ICONIQ Vol.2 mixtape will continue to shine light on hip-hop and drive the culture forward." Last year, the ICONIQ mixtape featured tracks from SoundCloud artists including Rarri, Valee, $teven Cannon and many more. This year, the ICONIQ Vol.2 mixtape will feature 19 original tracks from The LOX, ELEVATOR's emerging artists and the Hpnotiq community. The first release will become available on ELEVATOR's Website on July 12, with the second release to follow in January. Select music videos will be available on the ELEVATOR's YouTube channel, every two-weeks following the mixtape release.